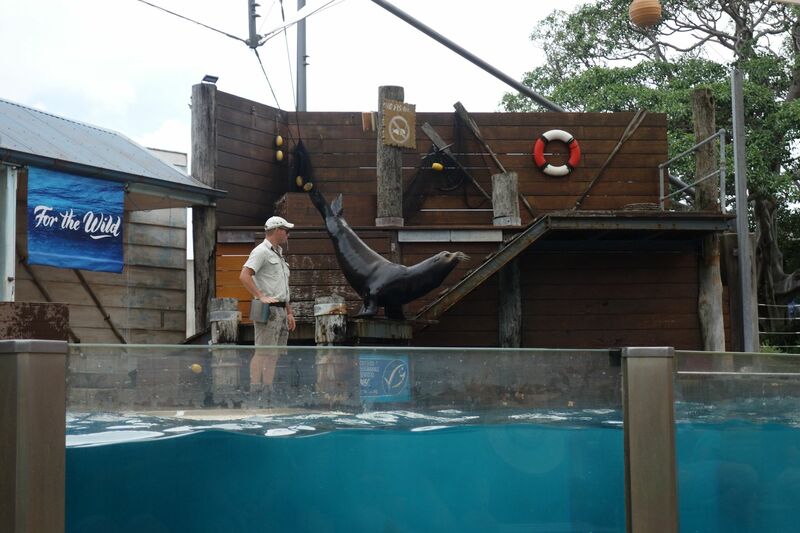 Taronga zoo has a beautiful location overlooking Sydney harbour and one of the key attractions in Sydney. 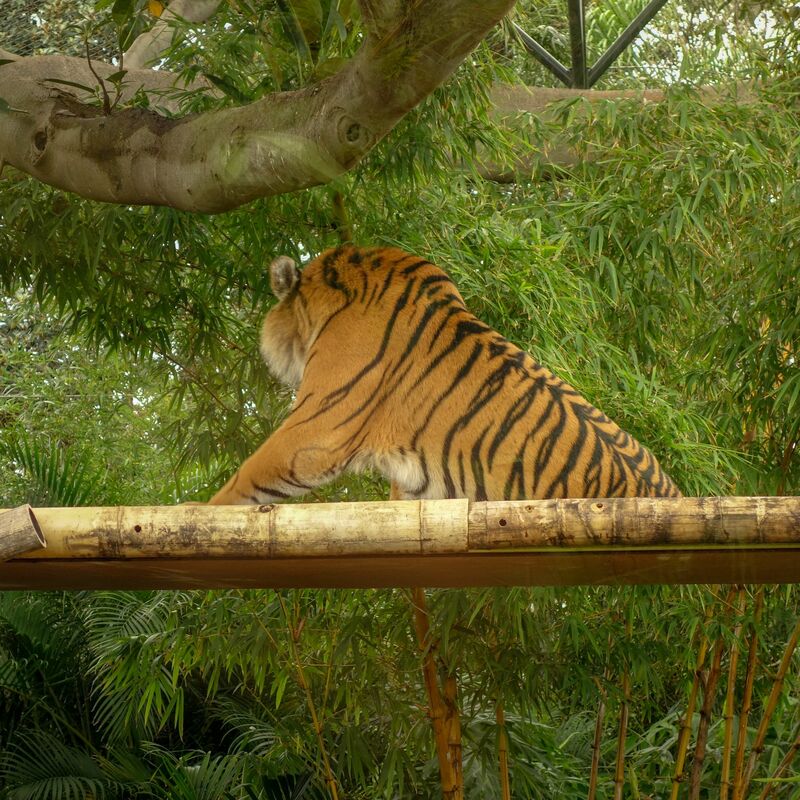 Mum and Dad got us a voucher for Christmas to be zoo keepers for the day on 16th March 2019. Jasper set his watch to countdown the days – we were so excited!!! As we were going for the day, we needed to bring a packed lunch, clothes (which you don’t mind getting dirty), closed toe shoes and a waterproof. 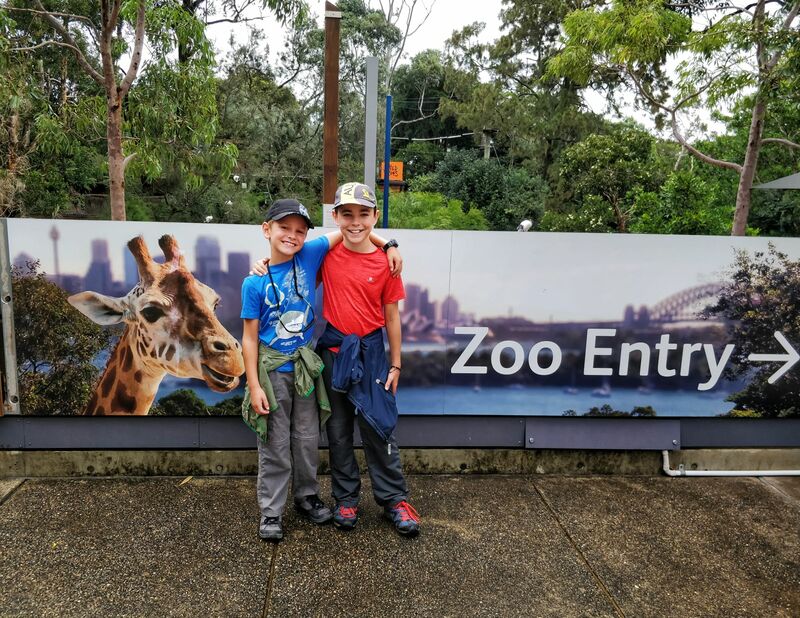 We needed to meet our guides at the entrance of Taronga zoo at 9.45am. We arrived and found that we would be accompanied by a whole load of other kids. 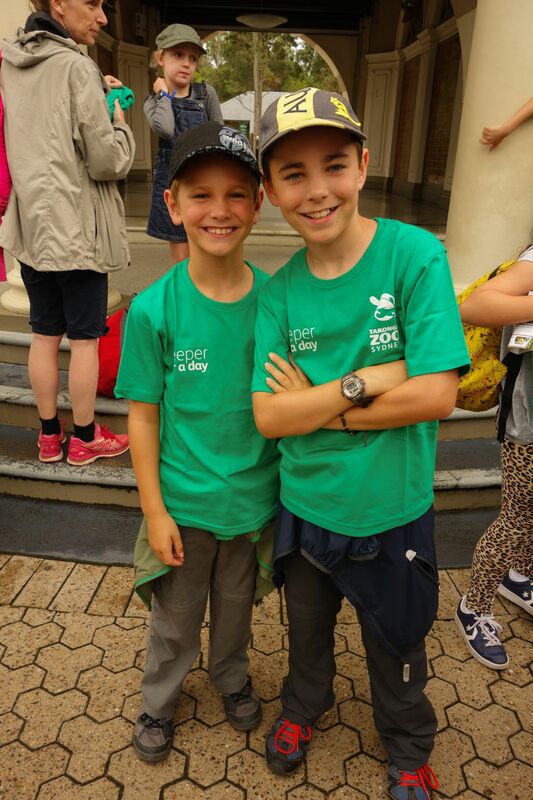 When we got started the guides gave us our Taronga zookeeper t-shirts that we had to wear throughout the day. We went down to the Koala enclosure where we started counting all the koalas to make sure they were all in their pen. They were extremely hard to spot to start, but once you found them they were everywhere. 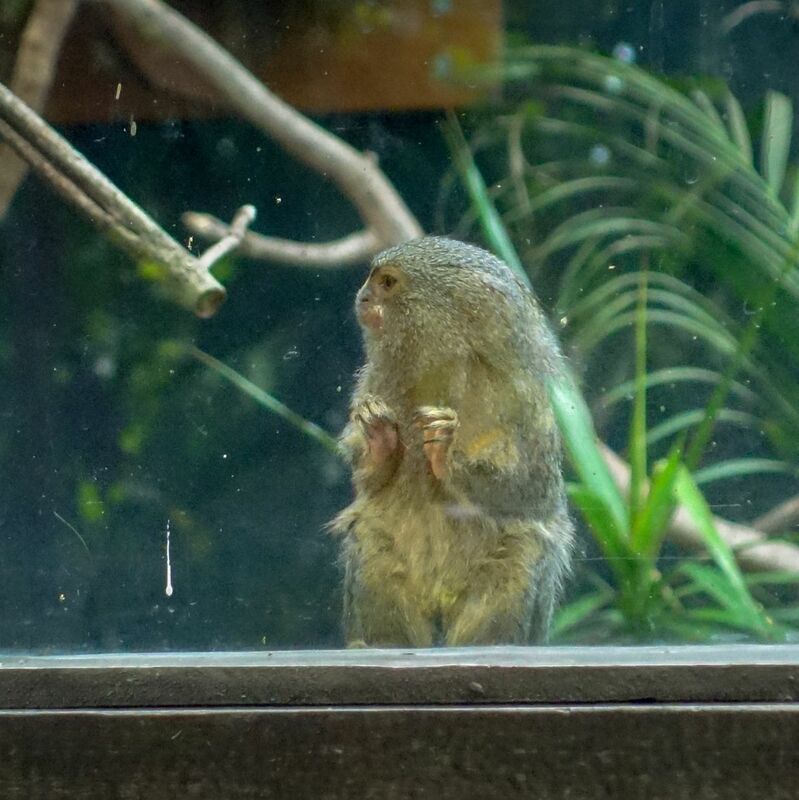 Unfortunately we weren’t allowed inside the enclosure so we’re counting from the window! A fun fact we learnt was that for 2 weeks the baby koalas had to eat their mothers poo to get the right bacteria so that they can feed on Eucalyptus. Yuk! After the Koalas we moved onto a species of Endangered frogs, but just had a quick glance, before we moved onto the Chimpanzees. We got a really good sight of them. 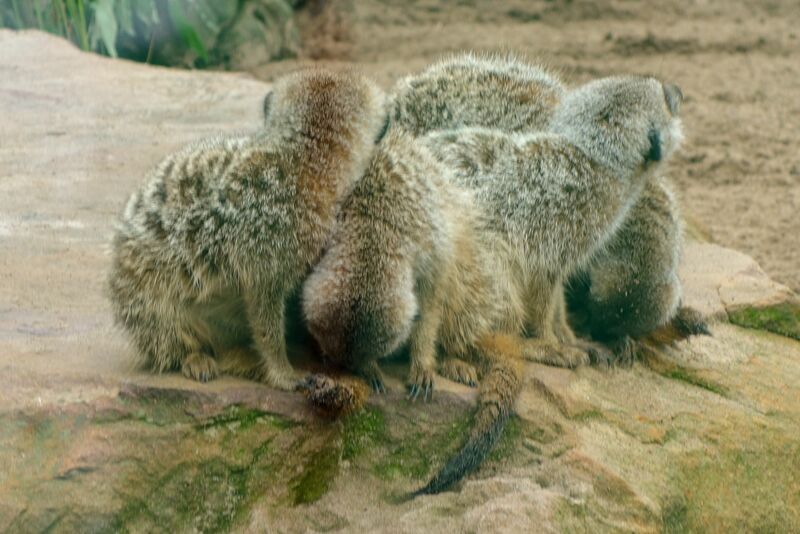 To simulate what they would do in the wild the zookeepers fed them through a pretend termite mound. The chimpanzees were cleverly using a stick to put in a hole in the pretend termite mound and get their food. Next we went on a walk around the zoo and saw the Sun Bears (we already saw these in Borneo) and Sumatran Tigers (they were HUGE). 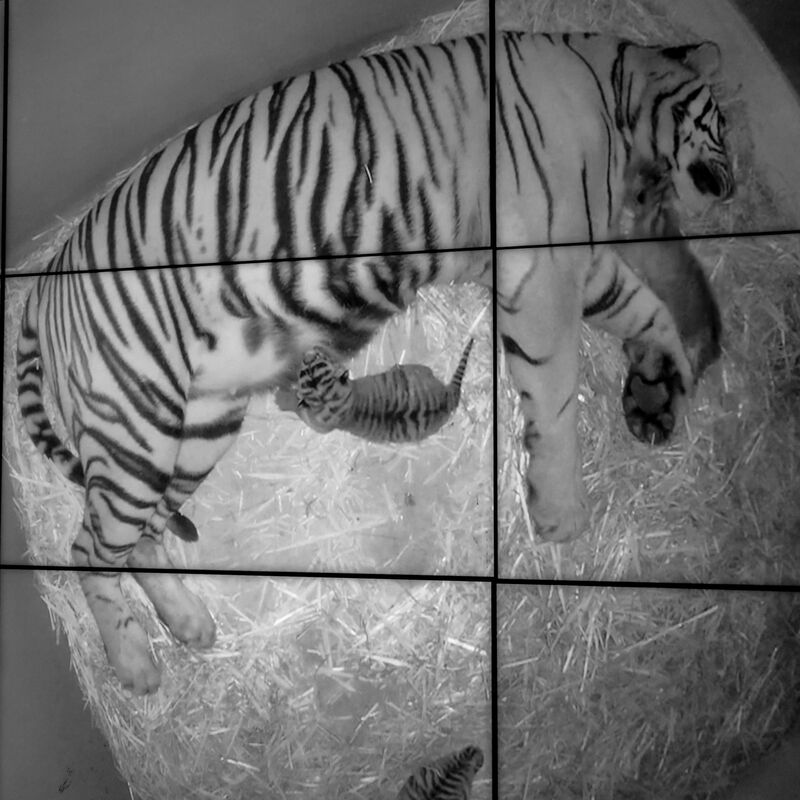 A few weeks ago one of the tigresses had a litter of baby tigers which we could view on the TV screen. After this we visited the Meerkats which were just messing around. We arrived at the Elephant enclosure and we saw how the keepers made enrichment. 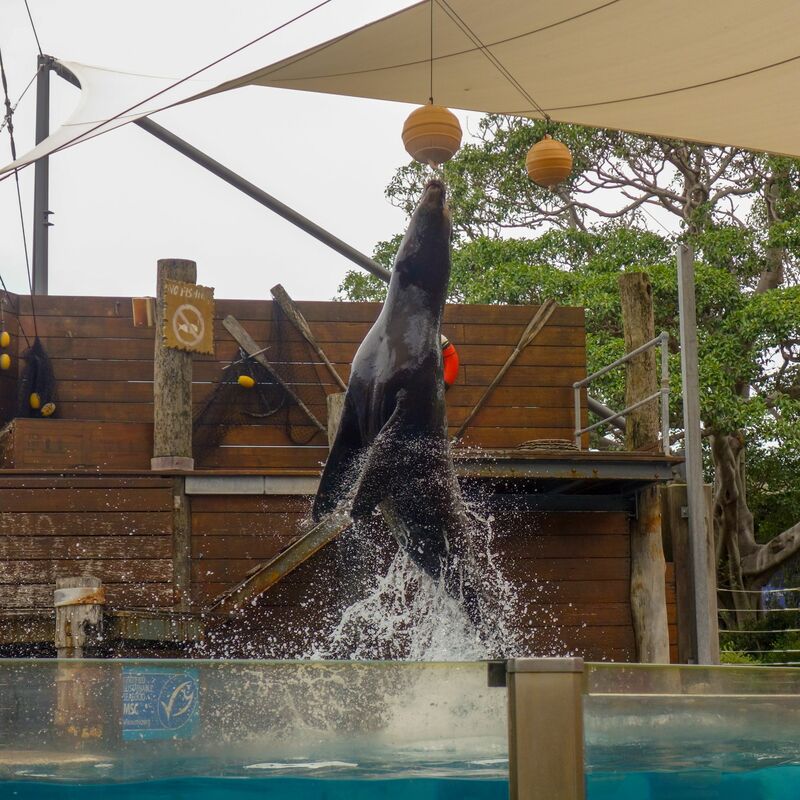 By the way, enrichment means entertainment for animals! They put a tyre on a chain that the baby elephant was pushing and a wooden plank with barrels at the bottom. When we arrived the Giraffe enclosure we had to try and tell the difference between each giraffe. We could do it. All you had to do was look at the shades and spots, as one was a little more white than the rest and another one was a little more crinkly and the other was just normal. Then it was time to do some dirty work at the farm. First of all, we needed to get the goats outside so that we could clean the pens inside. We had food in our hands and we chanted ‘goats, goats, goats’ and they knew this meant food time. Once they were outside we closed the door and went to get our equipment. Jasper got a shovel and Ethan got a rake. We had to shovel and rake the poo and old hay into the bin. Next we had to lay down some sawdust. It was hard work!!! There were also Alpacas. 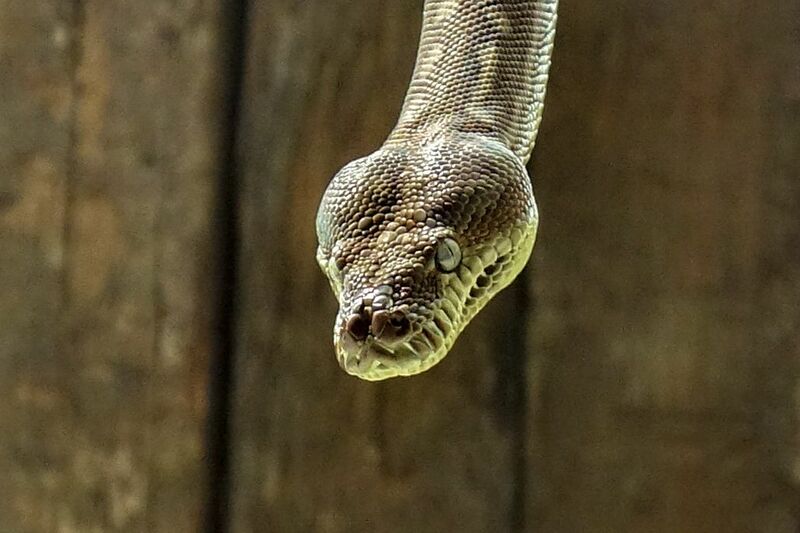 When we went past a room we saw lots of snakes too. There were lizards, skinks, mice, locustus, huntsman (a huge spider) and bees. While we were cleaning up we found a little locusts so we brought it to the guide and she put it back in the box. (We were too busy to take photos). After a busy morning it was time for our packed lunch. We went to seating area just outside the bush friends enclosure and talked with our new friends. As we were chatting, a Kookaburra decided to swoop down and take someones lunch! (we were told about this, but nobody listened). One of the guides went over and took some leaves from a tree and told us it was called lemon Myrtle. We sniffed it and it smelt like a sweet lemon. We began the next part of our tour and stopped by one of our guides favourite animals – the salt water crocodile. He told us a cool story!! There was a guy with a crocodile farm and he thought this crocodile was very special so when he sold his farm he took the crocodile with him. He started his own bar and the crocodile was his star possession. Everybody loved going to a bar to see the croc. When the man died he gave it to his daughters and they didn’t really want to have the crocodile, so they gave it to Taronga Zoo. 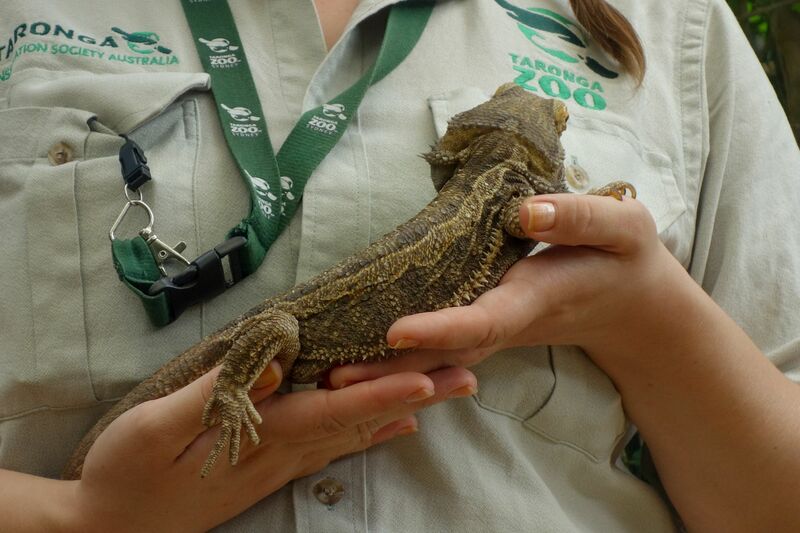 Which was perfect timing as the old Crocodile who lived at Taronga zoo, passed away! So this is where he now lives! After this, we went behind the scenes to visit the seals kitchen (we weren’t allowed to take pictures). It smells really bad – lots of fish!! It was even worse when we went into the freezer section, and it was really, really, really cold – Jasper liked it though! While we were there we passed a water filter which helped clean the water. They bring in dirty sea water, clean it and send it back into the ocean. Now, because of Taronga zoo whales, seals and dolphins are starting to make a comeback in Sydney Harbour. Amazing!! We went in to the avary where we saw Royal spoonbills, paraqueets, ducks and coy fish. It was only a short walk. On the way to the seal show we passed the seals, their cub and the pelicans. We sat on the front row in the splash zone. 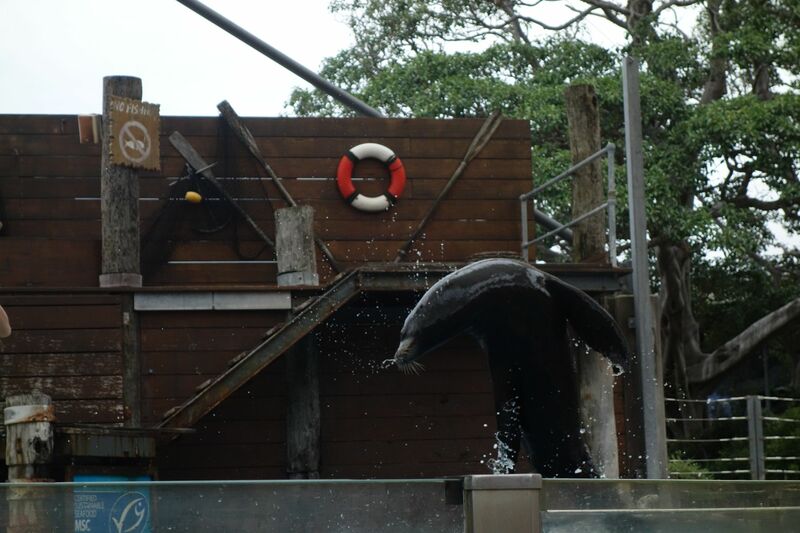 We saw the seals do all sorts of tricks like putting their fin out of their water, jumping extremely high and even doing a backflips. We got a little bit wet but not a lot. 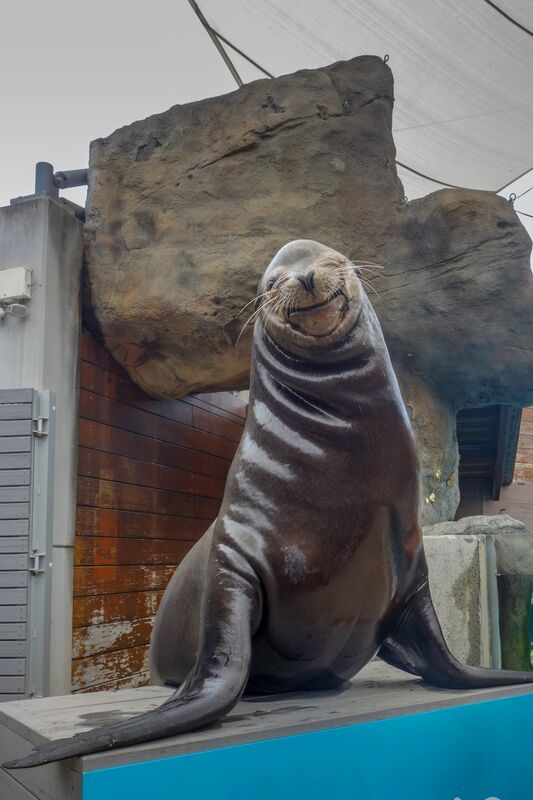 We even got a picture of one of the seals smiling! We went inside a building and through to the back (Behind the scenes) where we saw lots of different rooms which were set up as different environments, such as desert, rainforest and grasslands. We then saw different animals living in these environments. Then we went outside and saw Pygmy monkeys, which was sooo cute. They were about 10cms tall. We also saw a Bearded dragon. We then went over towards a building and we were met by a man holding a carpet Python around his neck. We each got to touch it but we had to be careful as it was new to the zoo. 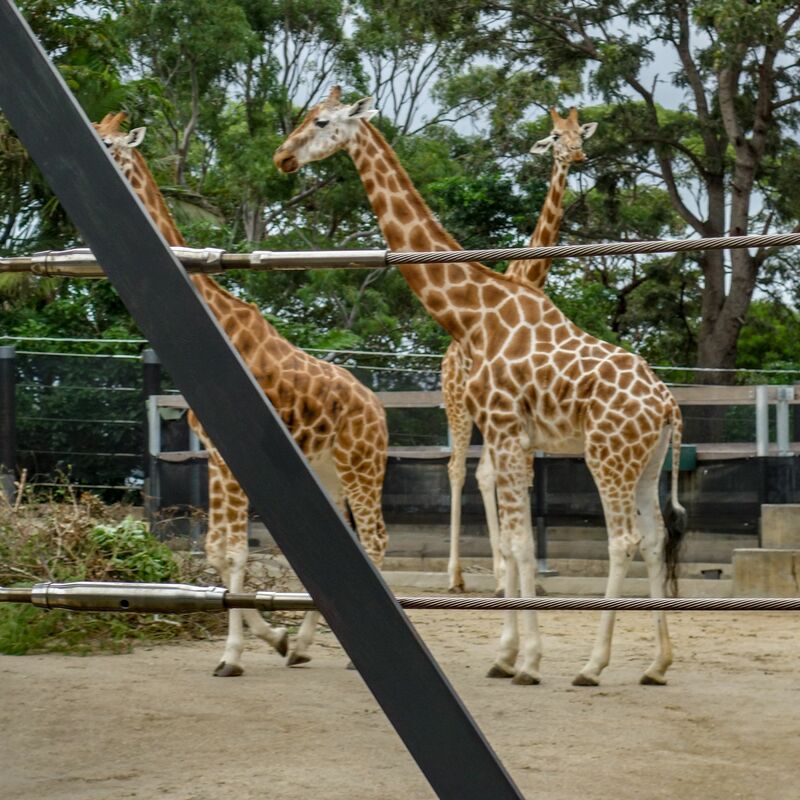 It was becoming used to humans so that it can become part of the main Taronga zoo. 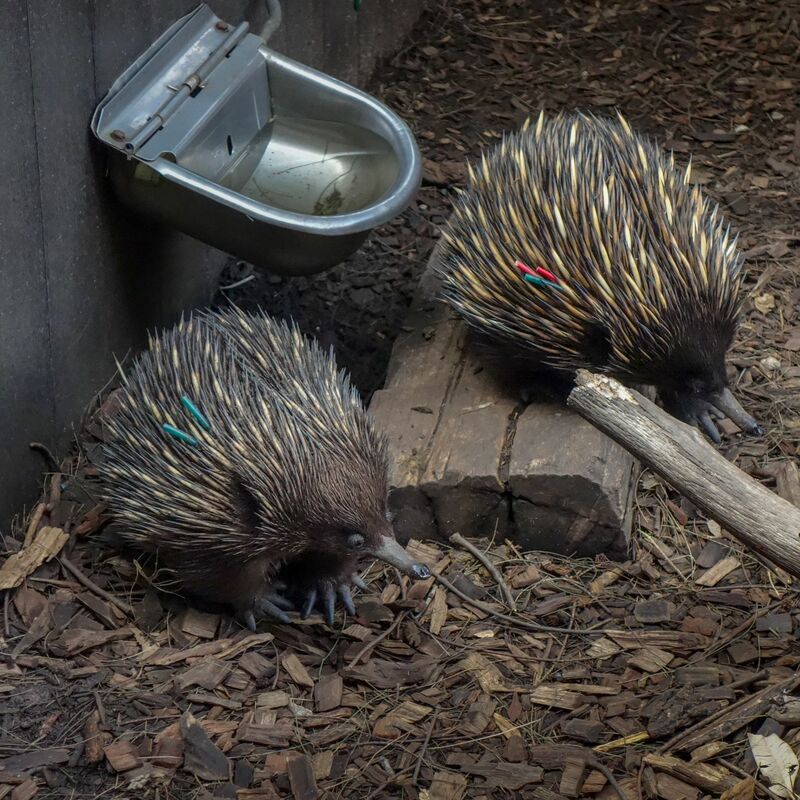 Next we went into the Echidnas enclosure, where we made their enrichment. We were handed toilet rolls which we had to seal one end so that we could put a mixture of Echidnas food (mushed up insects – yum!!). We sealed the other end then we hid them in hard places within their enclosure. We walked around the back of the building and got some edible berries for the possums. We headed into their enclosure, we got half a berry each and fed it to the possums, called Fred and George. We were able to stroke the possum, they were fuzzy like a big marshmallow with fur. We walked around to meet with the other group to meet our final animal, the tortoise. We stroke the shell and then headed back to the start. We arrived back at the front gate where we were met by our parents. It was one of the best experiences of our lives. It was epic. We definitely recommend it to any ages. You’ll have a brilliant day, just like we did. If you are interested in more information then follow this link.